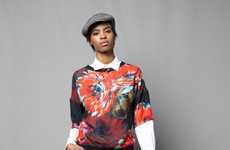 The Nicole Miller Fall 2014 collection at New York Fashion Week was made for "independent women who don’t need a business suit to feel strong." Instead, Miller created fashionable alternatives to suits, inspired by the Japanese-animated Princess Mononoke. The woman warriors in Miller’s latest collection are well-dressed with earthy tribal patterns that have a feral quality to them and leathers, which naturally exude a toughness. In the collection’s few instances of color, the warm autumnal colors at the beginning of the show transform into midnight blues and purples. As well as these few hints of color, most of the collection was ground by the color black — an armor that’s fairly familiar to most women.